By Rebecca Nickols on October 20, 2013 Visit Rebecca's Website. This 12×12′ shed started out life with an open front for the benefit of my two donkeys when they were in the small pasture near the house. Then it graduated to a shed with doors and a “loft” to be used for equipment storage with some donkey storage in the summer. When we decided to get chickens it was a natural choice. It was going to be a real job to actually get electricity to the building and we needed it for the automatic door. I saw a solar application online and basically jumped for joy. 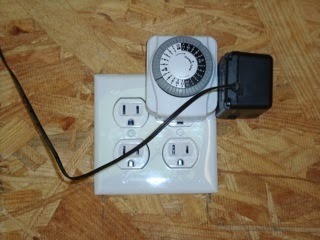 There is a special 12V battery (about $106) that charges and runs an electrical outlet. I purchased a kit with the panels and the wire connections for under $300 and another little part for $20. I have a timer on the door controls so it opens in the morning and closes in the evening. We free range the 4 hens (the 5th hen was a rooster, not allowed in our POA) by opening the door to the pen every morning. There is a small light fixture that can be plugged into another timer for winter morning lighting to keep the hens laying. We have not needed to run a fan, but could. I haven’t worked out the “water in winter” solution yet as I’m not sure if the solar can handle a heating element. Possibly another panel can be added if necessary. 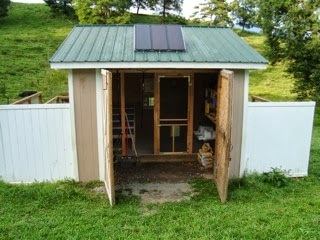 The coop has a gravel floor to which we added those 16×16 patio bricks for a floor since water can run into the shed. 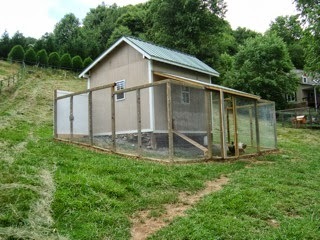 The bricks raise the floor enough to keep everything dry for the chickens. The litter is about 4 or 5 inches of sand. We put up a wall inside, leaving about 4 feet inside the big doors for food and equipment storage. 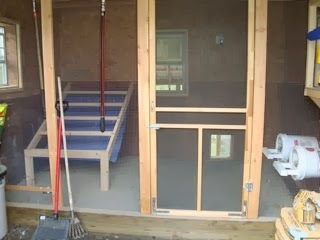 The wall is wire cloth with a door, finished to the “loft” so that critters cannot enter that way. We also installed windows on three sides, with the doors on the fourth side for ventilation. The solid panels on each side of the door face the road and are for “looks”. The pen is large enough that the chickens could be confined all day if necessary (or if we are out of town and someone else is doing chicken care). When I had to give away Bonny (my Delaware who turned out to be a rooster) I saw how yucky chicken coops sometimes are – I felt bad leaving him there with the nasty, wet, disgusting bedding and overcrowded conditions. The people did free-range part of the time though. 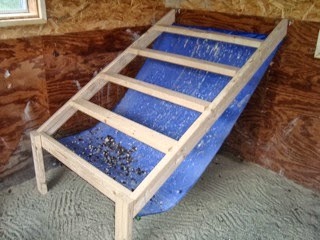 I guess cleaning the coop was not in the plans… I would have been VERY embarrassed if anyone had seen my coop looking like that..
Bedding with sand is the best idea I have found yet. Since I’m a horse person and I clean my horses’ stalls and paddocks each day (twice in the summer because of flies), it would be hard for me not to clean each day at the coop. I flick each little dropping into the scoop using the little rake like a broom and the scoop like a dustpan (actually a dustpan with a long handle would work if care was taken not to include a lot of sand). I rake around a little and see if I missed any that they covered up. Every couple/three days or so I clean off the droppings tarp into the manure bucket. I found the tarp on a gardening supply site – it’s a thing for picking up leaves (a tarp with a dowel along two edges that comes apart and folds up) – cut in half, it made two tarps so I have an extra. I’m hoping that, by keeping the sand clean, I won’t have to re-do it… but I have a plan if I do. All food and water hangs outside under the shed row so as not to encourage the hens to stay inside any more than is necessary except to sleep and lay. There is a tarp hanging under the roost to catch poop and I use a couple of tools I found/fixed to pick up any droppings each day and then clean the tarp every few days. I use the 5 gal. 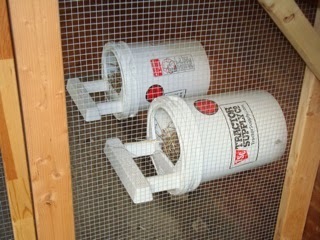 buckets with custom tops (found online) as nesting boxes and currently have only two installed. One hen lays in a sand nest she builds each day using hay out of a nest box after digging a depression… At least it’s in the coop! I’m planning to add another 4 hens next spring to make a total of 8 which, I think, is about enough. I found the site for the lids online (here’s the link: Fowl Stuff) and bought the buckets from Tractor Supply Co. I saw the idea in Backyard Poultry, – I keep an eye out for any good information. The chickens cannot perch on top of these nests… I bought 4 and I will install the other two if I increase the flock size. I’m thinking 4 more chicks in the spring (have to replace my Delaware). There is a lady in Asheville, NC who orders and raises the chicks for a lot of us. By combining the orders we can all get whatever we want and we can pick them up at any age we want. The cost depends on how long she keeps them. Here’s the link for the automatic door of our coop: Automatic Chicken Door Openers. I felt that the wood construction was better than metal. The wood in the sliding door warped (it has rained almost every day here this summer) and stuck, breaking the string. ALWAYS make an access panel for these doors. I wrote to the maker and told them that information should be in their instructions as we had to take down half a wall to get to it. We took three sheets of plexiglass and glued them together to make a good thickness for a new door – works great. I guess a metal door would not have a warping problem, but should still have an access panel so it can easily be repaired. I’m also hoping security will hold – there are a LOT of wild animals around. The last two years crows have moved in. The hawks moved out and the number of songbirds at the feeders dropped, but the chickens are probably safer. We have two dogs who pee all over (leaving their scent) even though they sleep inside. The next job is to beautify the coop into something interesting and attractive. I already have a couple of planters to attach to the solid white fence panels and I think some flowers along the fence would be good. Even if it was just a tangle of morning glories it would look nice… most of this will have to wait until spring though. 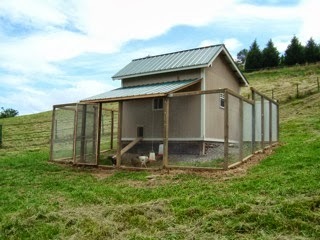 Thanks Gail for sharing your coop, construction and the links to the features that you have added. It’s very helpful to hear from someone who has tried out a product (and shares its pros and cons) before purchasing it and adding it to your own set-up. I love your perching ladder. How much room does it take up? Thanks for the great info and your coop is beautiful! I have a question. What kind of sand do you use as your litter? Thanks! Your chicken coop and ideas are great except for one. You lost me when you lamented about how BAD YOU felt leaving your rooster in a squallored environment, but didn’t feel bad enough to take him back and find a safer, more cared about home for him. Instead you condemned him to a life of unkempt, uncared for actions. Why? Just because he didn’t fit into YOUR scheme of chicken life. Your cavalier justification (& worse) are all too common in the ag/animal farming venue….. Sand sounds nice but I had read that in the northern states sand should not be used due to retaining the cold and possibly freezing the chickens feet. Yes, no? Any words on this? Re: winter watering. I’ve found that a 50 watt light bulb placed in a “single hole” cement block that has been insulated around it’s perimeter with foil-backed foam board and topped with a piece of tin will produce enough heat to keep a metal chicken waterer from freezing. We are just outside of Asheville NC. Will you provide me with contact info on your chicken person? I like it! I, too, clean the droppings from inside the coop on a daily basis and it has served us well for several years. Keep it up! DO YOU HAVE THE INFORMATION ON THE SOLAR PANELS THAT YOU INSTALLED? I WOULD BE INTERESTED IN LOOKING INTO THAT OPTION. Check Harbor freight. Their solar panel kit I have ran 1/3 of my house off grid and my garage. that is what I will be using once I get started with my flock. 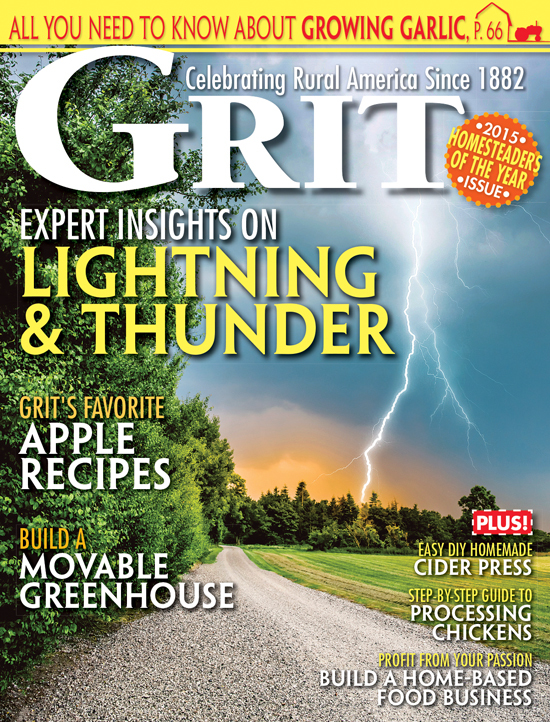 2-100 amp hour marine batteries and you have a ton of power. but remember with solar if in the north country you need 5 hours of 50%+ sun light to keep batteries fully charged. Plant Swiss Chard and other edibles for the “girls” kale, lettuce and cabbage in front of the fence! Wow. I have never met or even heard of anyone who cleans up all the droppings every day. That may get tiresome as the flock size is increased? And, it’s been found, deep litter with the droppings turned into it, is far healthier for the chickens than a “clean” floor! Beneficial microbes break down the poops and produce antibiotic substances that control pathogenic bacteria. They also produce vitmins K and B12, which the chickens ingest as they scratch for things to eat in the litter. (Folks toss in compostables and let the litter become a composting unit that the chickens keep turned for you. Research shows much less disease in chickens kept this way! You can Google for “deep litter chickens” for lots more info. on this and there is a chapter on it in Harvey Ussery’s book, The Small-Scale Poultry Flock. I just started a new flock this spring and this is the method I chose. The litter needs to be a foot deep to host the microbes well. We’ll have it that deep soon. In defense of sand & daily cleaning: What encouraged me to try sand was that I’ve never heard of anyone who tried sand on the floors who ever switched back to traditional bedding. Mine still have a little bedding if they choose, but the sand is WONDERFUL and much more hygienic…AND cleaning at least every other day keeps flies, ants, & odors away. Also, no food is wasted when it falls to the floor. The sand can be re-sterilized if necessary; it is much cheaper; and it is cooler in the summer. When I worked at an animal shelter for dogs, the pens were all outdoors with each pen having an indoor area accessible by doggie door. Every day the entire area was cleaned. The outdoor area was a dirt/sand floor with occasional gravel thrown in. The reason for this was after picking up feces, we would rake the entire outdoor area to keep smell down without having to wash it out on a daily basis, something that would have to be done with concrete. It keeps the fly population down, too.